i’ve been wanting to give my supplies a little more room to breathe – and just last weekend my husband said, “why don’t you turn the downstairs bedroom into your craft room?” i’m sure there is an ulterior motive there (we have another spare room which is slowly turning into his beer room), but i’m running with the thought. here’s a sneak peek of a little corner in my new workspace. more pics to come… pretty soon my craft night fridays will have a new home (instead of the coffee table)! these regular posts will feature new handcrafted goods that i’ve recently added to my collection. it might be jewelry, home decor, stationary, etc… whatever it is – it’s probably something i purchased on etsy, at a market or from some other local gem with limited production. this week i want to bring attention to my new bolo-necklace. i’m obsessed with it. i’d been set on the thought of getting a bolo necklace for ages now. i’d had a few bolo ties in the past, but always something trendy with a leather or fabric cord and only suited to particular outfits (i was especially into them 20 years ago back in jr. high school… they were actually a bit frightening. i’ll see if i can dig up some photos). this time around i knew i wanted something brassy gold and a bit timeless. i had spent months searching on etsy and then alas… one day i found CheyneByPaige. she had one nearly identical to what i’d been looking for. i contacted her and asked her if it would be possible to make a few changes to the chain… she could. and then voila, there was the perfect bolo-necklace! 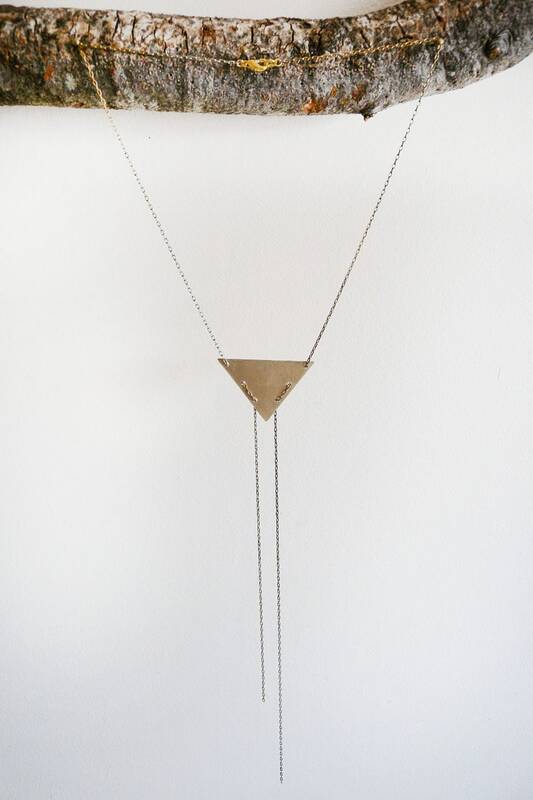 it’s a brass triangle with a long brass chain woven throughout it and dangling for inches (photo + link below). (bolo backstory: while embarrasing to admit, i also saw a necklace similar to this one on bravo’s reality soap “gallery girls” – a show full of overly dramatic twentysomethings with not-so dramatic problems. claudia, one of the artsy hipster “brooklyn girls” (as opposed to the show’s preppy “manhattan girls”) was wearing a bolo tie in an episode. turns out it was marketing for their shop end of century. i had a look on the website and there’s one very similar to it for $396.). thanks for joining us for our first handmade find friday. have a wonderful weekend doing something stressfree, creative and fun! while i still love myself a little browse on threadless, i’m more into a word or two scattered around the house instead of on a t-shirt. i ordered the word pillow in the photo from a shop (french silver) on etsy. in addition to LOCAL, i also have HOMEGROWN. i love these pillows. the words + the burlap make me feel all homey and good. while I didn’t create these pillows, i recently stumbled upon a diy project that gave me a little spark to do something similar myself. and it doesn’t have to be a pillow, but instead maybe a tea towel, wall art, anything… it’s super simple and cheap. check out the said project + pic below. well well well… it might appear that i’ve been less than crafty the past few months – though actually it’s quite the opposite. while i admit i’ve been less than a stellar blogger, i’ve been keeping busy planning an array of projects. as of today, i’m just 3 weeks out from my biggest craft project of all… my wedding! in a few days i’ll head back to the US in preparation for the big day. my mother’s closets are overflowing with etsy, ebay and thrift store purchases. you see, our wedding is a handmade affair. a sustainable engagement ring from utopian creations, wedding invitations made by shopbellsandwhistles, a custom dress designed by ktjean, decor from thelonelyheart and ElizabethSt (among many others), photobooth props from WhiskerWorks and the list goes on and on… these touches mixed with vintage mason jars, wooden fruit crates, farm fresh flowers, locally sourced eats by antique kitchen and a bar full of craft beer – all will help make this day something that truly represents who we are through a million personal little touches. so00000 – though i’ve been quiet, please know that i’m keeping busy and in a few weeks i’ll have lots of crafty goodness to share!